Useful for sealing stoves, boilers and flues. 12mm braided glass fibre seal. Sold by the metre, eg buy 3 and receive one big 3 metre length. 12mm fibre filled glass rope. 20mm fibre filled glass rope. 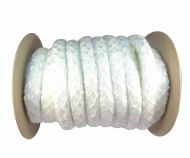 6mm braided glass fibre sealing cord, sold by the metre, eg buy 3 and receive one big 3 metre length. 9mm braided glass fibre cord.